The score for the work consists of 8 decks of cards (one for each part) each containing 20 cards (one for each event) plus a cover card and a folded instruction sheet and a “magic 8 ball” for each performer. The composer requests that public performances of the piece employ real, physical 8 balls and printed parts in the "card deck" format. Twenty Answers is a work for 8 or more (or less) players and a magic oracle. As it was commissioned by the Empyrean Ensemble, its parts were created with their instrumentation in mind (flute, clarinet, violin, viola, cello, piano and percussion) combined with the instrument of the composer (voice and electronics), but it can easily be adapted to any group of instruments. A work of ever-shifting melodic and rhythmic fragments– the piece nods to the memory of Cage with its heavy reliance on “chance operations” and its employment of silence and listening. 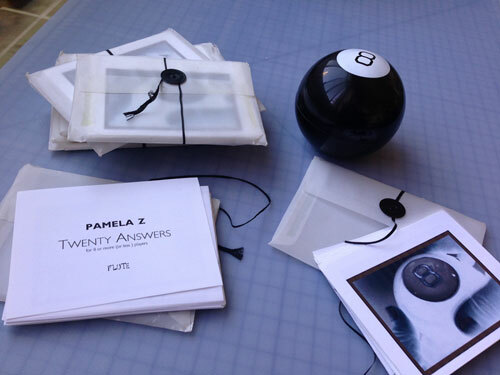 Each player’s part consists of twenty events– the order and content of which are determined by answers generated by a fortune-telling device (the "Magic 8 Ball"). The idea for the piece came as an outgrowth of Ms. Z’s work exploring the binaries of “Yes and No” and the intriguing methods people have devised for divining answers to “Yes and No” questions. This piece recieved its premiere by the Empyrean Ensemble at UC Davis in January of 2008. It has also been performed by Canyonlands Ensemble at the University of Utah at SLC, the Maverick Ensemble in Chicago, and the Elmhurst College New Music Ensemble in Elmhurst, IL. In 2017, an adaptation for laptop ensemble was created by Paula Matthussen, and was performed by Toneburst Laptop & Electronic Arts Ensemble at Wesleyan University. Printed parts hand-made by the composer. An 8 ball for each player.